Persistence Market Research offers an eight year forecast on the global dental CAD/CAM & dental prosthesis market. The primary objective of the report is to offer updates and information related to the market opportunities in the global dental CAD/CAM & dental prosthesis market. Dental CAD/CAM & dental prosthesis is one of the most prominent segment of oral care. It has a diverse reach to end user applications and also getting used in research applications and routine treatment of dental restoration provided by the healthcare professionals to the patients. Physicians mostly prefer dental CAD/CAM & dental prosthesis for dental restoration, which is expected to drive the demand for dental CAD/CAM & dental prosthesis over the forecast period. Besides, the growth of the dental prosthesis market which is related to the growing number of distributors, who play a vital role in a product to be shipped to a selective class of consumers. 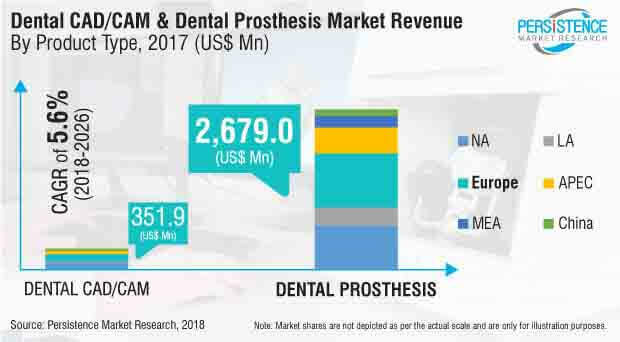 And with the increasing number of clinical cases that are performed with the help of dental CAD/CAM & dental prosthesis is also expected to fuel the growth of the market to generate higher revenue. Furthermore, to understand the market correctly, the report is categorically split into three sections viz. market analysis by product type, end users and regions. The growth of the dental CAD/CAM & dental prosthesis market is dependent on various economic factors, industry dynamics, technological advancements and demand, which makes it a rather open and diverse market for the manufacturers and potential distributors. The key players in the dental CAD/CAM & dental prosthesis market are particularly focusing on acquisitions, mergers, expansion, launching new products, distribution and adoption of new technologies. The report analyses the global dental CAD/CAM & dental prosthesis market in terms of value (US$). The report begins with the market definition and overview explaining different market segments. Recent developments and major trends in the dental CAD/CAM & dental prosthesis market enable to identify the overall market scenario in various regions with the analysis of historical evolution of dental CAD/CAM & dental prosthesis in the market and possible future growth opportunities. The market dynamics section includes PMR’s analyses on key trends, drivers, restraints, opportunities and macro factors influencing the global market. Impact analysis of key growth drivers and restraints based on weighted average model has also been included in the report to better equip clients with crystal clear decision-making insights. In addition, we have taken into consideration the year-on-year growth and incremental $ opportunity to understand the predictability of the market and to identify the right growth opportunities in the global dental CAD/CAM & dental prosthesis market. Another key feature of this dental CAD/CAM & dental prosthesis report is the analysis of key segments in terms of market attractiveness index. This is the combination of market share index and CAGR of an individual segment and it provides the incremental opportunity of particular segment in the overall market. This parameter is very critical for assessing the level of opportunity that a player in the market can look to achieve, as well as to identify potential resources from the sales and delivery perspective of the products. The resulting index helps client to identify real market opportunities. In the final section of the report on the global dental CAD/CAM & dental prosthesis market, the ‘Competitive Landscape’ is included to provide report audiences with a dashboard view, to access the key differentiators among the competitor firms. This section is primarily designed to provide clients with an objective and detailed comparative assessment of the key providers specific to a market segment in the dental CAD/CAM & dental prosthesis market and participants across the value chain. Moreover, this section also includes market strategies and SWOT analysis of the major players in the global dental CAD/CAM & dental prosthesis market. Detailed profiles of the providers of dental CAD/CAM & dental prosthesis are also included in the scope of the report to evaluate their long- and short-term strategies. Examples of some of the key players in the global dental CAD/CAM & dental prosthesis market are 3M, Dentsply Sirona, COLTENE Group, VOCO, Den-Mat Holdings, LLC., Danaher Corp., Straumann Group, Ivoclar Vivadent AG, and SHOFU INC. Dental CAD/CAM & dental prosthesis are used in different procedures with one common objective of bringing back the actual shape and look of the teeth. Dental CAD/CAM is a technology that is being used in the process of digital dentistry by which the model of a ready tooth is scanned and required prosthesis is produced. Dental care industry is driving heavily on dental prosthesis. Recent trends and innovations has led the maximum portion of dental prosthetics to be made through 3D printing. Due to the quality choices of 3D printers available, it has definitely influenced the industry in a remarkable manner. The capability of 3D printers to work has made it a key tool in zones that is not suitable for traditional methods. Dental CAD/CAM & dental prosthesis market is gaining mass acceptance globally with the trend of getting an esthetic change, where the influence in the healthcare industry to treat cases that are not completely advisable with traditional dental care are treated with dental CAD/CAM & dental prosthesis techniques. Dental CAD/CAM & dental prosthesis included in the report are products that are used for treatment of teeth. The growth of the global dental CAD/CAM & dental prosthesis market is primarily driven by increasing prevalence of conditions that require dental care using prosthesis, rising geriatric population, awareness programs conducted by public and private associations, edentulous population and growing number of dental clinics. However, manufacturers on a global level are engaged in developing products that should get recognition in order to be in use for a greater population. The dental CAD/CAM & dental prosthesis industry is more accessible for the new players with fragmented company profiles, majority of them distribute their products on the global level through different chains. Consumers are opting for brand specific dental CAD/CAM & dental prosthesis that provides a positive share for the leading manufacturers in order to provide better and more flexible end products. Stringent regulations observed globally for the dental care products are expected to hamper the growth of the global dental CAD/CAM & dental prosthesis market over the forecast period. Dental CAD/CAM & dental prosthesis helps the economic outlook by supply chain consolidation and lower inventory, rapid prototyping, increased productivity and decentralized/more agile manufacturing. The global dental CAD/CAM & dental prosthesis market is estimated to be worth US$ 9,403.6 Mn by 2018 end and is expected to expand at a CAGR of 5.6% over the forecast period of 2018 – 2026. Geographically, the global dental CAD/CAM & dental prosthesis market is segmented into six major regions, namely North America, Latin America, Europe, Asia Pacific (Asia Pacific excluding China), China and Middle East & Africa (MEA). In terms of value, Europe is expected to be the dominant regional market for dental CAD/CAM & dental prosthesis by 2018 end and is expected to expand at a CAGR of 5.8% over the forecast period. North America and Asia Pacific excluding China are expected to witness significant growth in the global dental CAD/CAM & dental prosthesis market, registering CAGRs of 5.4% and 6.3%, respectively, over the forecast period. Europe is expected to have a high growth in the global dental CAD/CAM & dental prosthesis market due to increasing demand for premium-priced dental products and favorable reimbursements. Also, increasing number of specialty dentists for implant placement in the region will lead to increased access to such treatment. Besides modest improvements in worldwide dental CAD/CAM & dental prosthesis market would effect the Europe market, APEC shows impressive growth due to expanding patient volume and price cutting. While most of the dental practices in the region are solo performed and dental clinics participating show a decent trend of growing with the advancements. It provides a quality opportunity for the entire dental CAD/CAM & dental prosthesis market. In European countries, the underprivileged population is covered under supplementary universal medical coverage scheme (CMU). In 2015, CMU expanded to cover more people, which is expected to boost the dental CAD/CAM & dental prosthesis market over the forecast period. Dental tourism is one of the most important sectors of the expanding medical tourism industry. Hungary is becoming a capital for dental tourism in the Western Europe as cost of dental care is 40-75% less in Hungary in comparison to the U.S. and other developed countries. Though Europe’s dental CAD/CAM & dental prosthesis market is expected to have a mere single digit growth for dental prosthesis and positive high growth for dental CAD/CAM due to flattening of dental care reimbursement policies in three out of five key markets in Europe including Germany, France and the U.K. Examples of some of the key players operating in the dental CAD/CAM & dental prosthesis market include 3M, Dentsply Sirona, COLTENE Group, VOCO, Den-Mat Holdings, LLC., Danaher Corp., Straumann Group, Ivoclar Vivadent AG, and SHOFU INC.